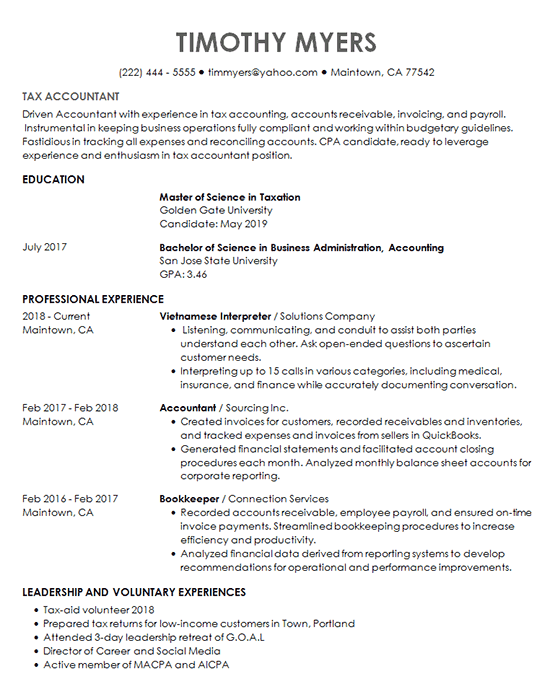 The summary for this accounting resume showcases the candidate’s tax accounting, accounts receivable, invoicing, and payroll experience. Even though the job seeker had recent relevant experience, education is next listed since he was soon graduating with a Master of Science in Taxation. Immediately following, is a recount of his professional experience starting with his current role. Relevant accomplishments are listed with bullet points. The accomplishments convey the scope of his contributions. The resume ends with a listing of his leadership and volunteer experience to emphasize the ability to be a team leader or manager. Driven Accountant with experience in tax accounting, accounts receivable, invoicing, and payroll. Instrumental in keeping business operations fully compliant and working within budgetary guidelines. Fastidious in tracking all expenses and reconciling accounts. CPA candidate, ready to leverage experience and enthusiasm in tax accountant position. Listening, communicating, and conduit to assist both parties understand each other. Ask open-ended questions to ascertain customer needs. Created invoices for customers, recorded receivables and inventories, and tracked expenses and invoices from sellers in QuickBooks. Recorded accounts receivable, employee payroll, and ensured on-time invoice payments.